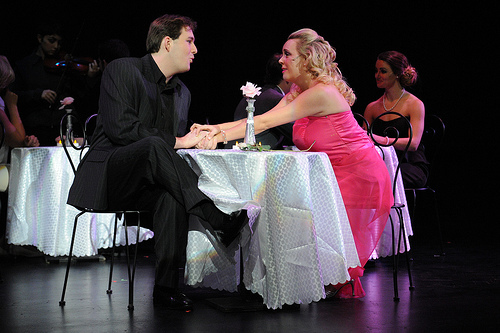 Orpheus gets in touch with their feminine side and brings Legally Blonde the Musical to the Centrepointe stage. The cast obviously had a blast and there were some definite shining stars in the bunch, but I cannot help but be disappointed with the stereotypical and oversimplified character types that made it difficult to enjoy the production as a whole. From novel, to film, to musical, Legally Blonde follows Elle Woods through her misadventures at Harvard while trying to win back the love of her life by proving how serious she can be. The once popular blonde bombshell becomes the laughing stock of the school for her obnoxious pink clothes and lack of intelligence. Against the odds Elle is able to prove herself and find love in the least expected places. Elle is played by the bubbly but fierce Emily Reid. Whether being backed by the ensemble or belting out a solo her voice and charisma filled the space and was a pleasure to watch. Nicole Milne as Paulette stole the spot light every time she came on stage. Derek Eyamie as Emmett was nerdy and sweet and had a voice that warmed our hearts. Jacob Atkinson as Warner had a shaky start but by the second act seemed to find his footing. A big shout out must be given to Courtney Vezina for her performance as Brooke Wyndham who jumped rope for an entire number that was no hindrance to her powerhouse vocals. The ensemble was able to support the leads vocally and although many fell into some cheesy acting, for the most part they were solid. That all being said one must focus on the bigger picture. This story shows us the negative impact on judging appearances and how the opinions of others can hinder someone from reaching their true potential, but with support and encouragement there is nothing one can’t achieve. This is a message we could all get behind, but the script falls short in accomplishing this when one-dimensional characters fall into oversimplified stereotypes. The female student who is strong footed and rebelling against the patriarchal oppression is immediately labeled a lesbian. At many times she is seen staring at other women but looks away when anyone notices. Instead of having a strong female character that was a lesbian, her sexuality is mocked from the moment she steps on stage. She is also told her passion is just her being over emotional and that would make her unemployable. I was almost surprised no one accused her of just being on her period. An entire song is dedicated to judging a mans sexuality on his appearance. Backhanded comments about women’s inabilities and homophobic slander is not any less offensive or demeaning because it is performed in song. It really took away from the message that was trying to be put forward and had me annoyed instead of enjoying the performance.